Paintings by Eddie Burrup first appeared in January 1995 in a mixed exhibition at Kimberley Fine Art ~ Durack Gallery in Broome, Western Australia. The power and presence of the works attracted interest and comment. The paintings were marked ‘not for sale’. The gallery’s director, Perpetua, was soon in touch with a leading Melbourne dealer specialising in Aboriginal art. From photographs the dealer expressed interest in seeing the originals. This was arranged but, for reasons unclear, neither the dealer nor Perpetua pursued the possibility of an exhibition in a capital city. Various works by Eddie Burrup, together with their descriptive titles, continued to hang ‘not for sale’ on the walls of the Durack Gallery throughout 1995. Requests to purchase the works were declined. It was enough at the time that the work be seen and talked about. 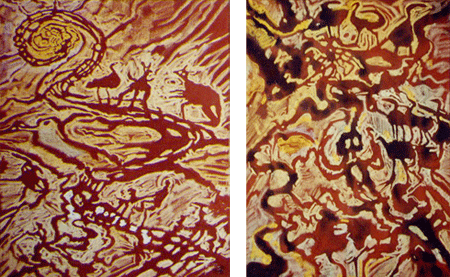 In December 1995 a painting by Eddie Burrup was chosen for the Durack Gallery’s Christmas card. About 100 of these cards were sent out to friends and gallery visitors. One of several appreciative responses was an invitation, via phone and in writing, to Eddie Burrup from the Director of the Tandanya Institute in South Australia to enter work in a forthcoming exhibition in Adelaide Native Titled Now . Perpetua, in Broome, sent a fax through to Eddie Burrup, in Perth, to enquire whether he would be interested in participating. A positive response was received. Subsequently three works were selected and hung in Adelaide in April 1996. Native Titled Now was a commercial show but as before the Burrup works were not for sale. The Tandanya exhibition, marked the start of official recognition for The Art of Eddie Burrup and was a significant step in the long-term goal of Elizabeth Durack’s work being assessed on its own terms, free from the dismissal or stereotyping to which her work had long been subjected. The road ahead was unclear but reaction to Burrup’s work in the Tandanya show and his acceptance as an artist in his own right provided tremendous fillip and focus. Paintings poured out. Through Eddie Burrup Elizabeth transported herself into a far past transferring on to paper and canvas a lifetime of living and learning, of shared experiences, anecdotes and loss. Titles flowed as she worked, many of them recalled from old stories and songs. Through all this, Elizabeth and Perpetua fluctuated between being prepared to call the whole thing off to firm conviction in the quality and importance of the art being produced via the medium of Eddie Burrup. 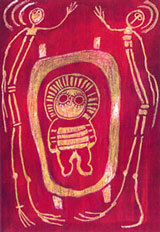 In June 1996, encouraged by the response in Adelaide, by the selection of Burrup works in Native Titled Now to tour nationally, and by mounting interest in purchasing his works, Eddie Burrup, through Kimberley Fine Art ~ Durack Gallery, completed an application form for Telstra’s 13th National Aboriginal & Torres Strait Islander Art Awards in Darwin. Soon after, following standard selection procedure, Eddie Burrup was invited to submit two works. In due course The Headwaters of the Yule River and Jinnawaeibinna Pool on the Yule River were exhibited in Darwin between August and October 1996. Paintings by Eddie Burrup continued to hang marked ‘not for sale’ but on three further occasions, when pressed by admirers of Burrup’s art, Perpetua sold works — albeit in each case for a very modest sum. Meantime, emboldened by success in Adelaide and Darwin, Eddie Burrup had set his sights on entering work for the annual Sulman Prize for subject/genre painting at the Art Gallery of New South Wales, Sydney. Had Burrup operated — been able to operate — entirely independently he might have applied, entered and been hung in the prestigious event. But by September 1996 Perpetua was pressing for the experiment to move to a stage where the association between Elizabeth and Eddie be formally clarified. Eventually, after dozens of faxes and phone calls, Elizabeth/Eddie agreed it was time for others, or at least one other, to be brought in. Few credible names came to mind but opportunity arose in September 1996 during a visit to Perth by scholar and art historian Robert Smith. Smith, based in Victoria, had been invited to talk about the artist Tom Roberts to members and friends at the Art Gallery of Western Australia. Elizabeth, who had known Smith professionally during his time in Perth in the 1950s attended his lecture and in discussion afterwards asked if he had time to call at her studio.